While Superman was away visiting what was left of his burnt out hold world Krypton, Lois Lane wrote an editorial "Why the World Doesn't Need Superman" for which she won a Pulitzer Prize. 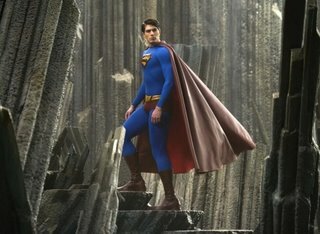 Superman Returns, the latest installment in the DC Comics saga, in many ways deserves a review entitled "Why the World Doesn't Need Another Superman Movie." Fear not, fans, Superman Returns is not a complete loss. Brandon Routh at least looks like the Man of Steel, and Lex Luther is played with diligence by Kevin Spacey, while Parker Posey offers some much needed comic relief as Lex's arm candy. The choice to use archival footage to bring Marlon Brando back as Jor-El was inspired, as it provides what little gravitas the film possesses. The writers have even included a twist in the form of Lois Lane's son, born just after Superman disappeared. Yes, the special efects are quite wonderful, but in this technologically driven movie industry, anything less would be a travesty. The problem is other than the questionable paternity of Lois' boy, there is nothing new here. Lex has another absurd scheme to rule the world and destroy Superman, the Daily Planet can't run too many stories on the Man of Steel, Jimmy Olsen can't get good photos of the Man of Tomorrow, and the populace can't enough of the Last Son of Krypton. But haven't we seen all this before? As far as all the hubbub about "Truth, Justice, and all that stuff...," it is a really minor point, but it does feel a little too PC. Maybe "the American way" was added during the Cold War, but it is the description of Superman that has prevailed for more than half a century. Ultimately, the only reason for another Superman movie is twofold: for all those who have not had the privilege of seeing the Man of Steel on the big screen and for all those geeky comic book collector who can't get enough of the man in the blue tights. I wrote a very similar article on my blog (http://mysterymanonfilm.blogspot.com/). Except for me, I focused on the way they ruined Lois Lane.